Extending your WAN to the public cloud presents unique challenges to Enterprise IT operators regarding the management of WAN connectivity to ensure optimal service, performance and security. In the final part of our webinar series, which is focused on SD-WAN and the Cloud, Viptela expert David Klebanov will demonstrate how simple it is to extend your WAN to your IaaS workloads, specifically Amazon. The Network Architect of Acadia Healthcare, shares his transformation journey across 100s of clinics. The main problems faced was an unreliable network that led to revenue loss at clinics. And the inability to roll out cloud-based EMR (Electronic Medical Record) systems on the traditional WAN. This will also cover how healthcare service providers face major hurdles with their network infrastructure to deliver innovative cloud-based patient services. 15+ years of status quo has created a rigid infrastructure that cannot support modern cloud-based in-clinic services. Major research highlights that most of the Office365 deployments face network related problems - typically manifesting as screen freezes. Limited WAN optimization capability further complicates the problems for most SaaS applications. To compound the issue, different SaaS applications issue different guidelines for solving performance issues. We will investigate the major reasons for these problems. - How traditional networks impair O365 performance, and why? Architects from ServiceNow share key integration elements of the SD-WAN architecture that are critical for IT operation teams. Cisco SD-WAN has full bulit-in automation with ServiceNow. As large portions of network infrastructure foundation transform with SD-WAN, how does this impact the resolution and ticketing processes for helpdesks? ServiceNow has been an integral part of Cisco SD-WAN deployments from the start, enabling end users to submit and track requests with this new technology. The integration consists of key alarms and triggering events that enable ServiceNow to automatically submit tickets for service problems, prioritize and assign them, and map them to any existing tickets. The integration provides complete control with IT service visibility for all outages. Network architect’s from REI share their transformation journey at one of the most reputed retail stores for outdoor recreational activities. The retailer has completed majority of its SD-WAN transformation at 150 stores/locations and will share the before/after picture on performance, manageability and security. This session will cover the range of issues plaguing the retail industry and their needs to modernize network infrastructure. Requirements in retail include improved customer experiences, store analytics, no outages at registers, a robust security framework for PoS/IoT and most importantly, simple, cloud manageability. Segmenting the WAN is now a critical feature in retail, especially to isolate PoS, IoT devices and gateways, voice and other applications. With a disappearing security perimeter, enterprises need to build a comprehensive set of defenses at the network and applications layers. SD-WAN solves one critical security piece of network security with features such as authentication, encryption, segmentation and service chaining. However, this must be complemented by sophisticated cyber security mechanisms beyond simple SWG. In addition to URL filtering, Adv. threat defenses and malware protection, the enterprises defenses must expand to a broader scope to address phishing attacks, DLP, and other malicious intents. This area covers combination of functionality including DNS, CASB, Firewalls and SWG. • Enable branch transformation by unifying cloud and on-site platforms — secure internet gateway with firewalls and software-defined WAN with routers. • Integrate the full networking and security stack to protect branch users, devices/things, and application usage at tens to thousands of direct internet access breakouts with simplified cloud management. • Defend against malware infections, C2 callbacks, and phishing attacks inside-out as well as unauthorized access and denial-of-service attacks outside-in. • Segment against lateral movement and compliance violations as well as ensures zero-trust security internal to the encrypted WAN fabric. Verizon has been involved with large global SD-WAN deployments with Cisco SD-WAN technology in banking, healthcare and manufacturing industries. This webinar investigates the lessons learned and best practices employed in these SD-WAN deployments. Verizon has been one of the earliest carriers to rollout SD-WAN, back in 2015. Enterprises who have deployed cloud and mobile services have migrated to SD-WAN infrastructure for predictable application performance. This has been achieved by transforming the network to create a single intelligent platform that responds to applications’ needs and adapt to changes quickly. Cisco SD-WAN and Verizon bring a fully integrated and customizable hybrid networking solution to increase bandwidth, agility and reliability while maintaining security through real life use cases and in-field deployment scenarios. As SD-WAN moves from early adopters to the mass market, there are a distinct set of use cases that stand out among the rest. IDC Analyst will share research insights on these major use cases and what enterprises should expect from SD-WAN in the next 12 to 24 months. As thousands of customers have adopted SD-WAN, the industry has seen more confusion than clarity with regards to feature requirements. Gartner has defined the four key requirements for SD-WAN (see below), but there still more critical features required to meet the enterprise-grade capabilities. For example, network segmentation to isolate critical applications has been a widely deployed feature since the Target breach. - SD-WAN solutions provide a lightweight replacement for traditional WAN routers, and are agnostic to WAN transport technologies (that is, they support MPLS, Internet, Long Term Evolution [LTE], etc.). - Based on business and/or application policies, SD-WAN solutions allow for load sharing of traffic across multiple WAN connections in an efficient and dynamic fashion. - SD-WAN solutions dramatically simplify the complexity associated with management, configuration and orchestration of WANs. - SD-WAN solutions must provide secure VPNs, and have the ability to integrate additional network services and offload Internet-destined traffic closer to the edge of the network. Join a panel of seasoned network engineers, experienced with SD-WAN deployments from the early days, as they debate their views and experiences with the technology. This roundtable discussion moderated by GestaltIT will uncover best practices and insights for network professionals on how to deploy SD-WAN technology and integrate it into existing network architectures. In this webinar, we will discuss lessons learned and best practices from customers that have gone through the journey of deploying O365 and SD-WAN. When considering a transition to SD-WAN, there are several important capabilities needed to suit an enterprise-grade network infrastructure. This webinar will cover critical SD-WAN features and how they translate to common deployment scenarios in different industries. This webinar will discuss case studies from customers across healthcare, financial, and manufacturing that underwent transformations to SD-WAN technology. We will walk through the major issues that drove the transformation, and the migration journey for each customer. Beyond significant reduction in WAN Opex, there are common themes of challenges that SD-WAN solves across industries. These include resiliency for critical applications, agile change control, secure isolation of critical assets, and building a cloud-aware infrastructure. New enterprise technologies are aimed at helping your organization move further into the digital transformation age. One significant area of focus is the evolution of the Wide Area Network-- the main connectivity highway for your workforce, cloud, and data center applications. Software-Defined WAN (SD-WAN) is a relatively new and innovative approach intent on virtualizing network intelligence functions and offering more optimized connectivity for the enterprise. It provides support to virtual environments and is being viewed as the next architectural change to consider. Cloud transformation has been a top priority for enterprises, but the adoption is plagued with complex workflows and poor user experience. Even though enterprises onboard AWS or Azure, the workflows to establish connectivity, security and segmentation across VPC (and VNET) are fairly complex. On the other hand, for SaaS, the issue is primarily around user experience. Enterprises deploying Office365 are realizing that performance with Skype for Business and Sharepoint is not reliable. In this webinar we will take a further look at the wide-ranging capabilities the Viptela Cloud onRamp solution offers, and deploying it for AWS, Azure, and Office365. Traditional WAN network infrastructure is breaking the adoption of SaaS and IaaS. Connecting users of an enterprise to application and infrastructure in the cloud requires many transformational changes. For one, the network itself needs to be cloud aware. Next, there needs to be unified management capability for both cloud and on-prem applications. Last, there needs to be a dynamic management of application experience based on realtime network unreliabilities. On May 16, join industry analyst firm EMA along with SD-WAN innovator Viptela, Bell Canada and CA Technologies for an expert panel discussion on SD-WAN challenges, opportunities and its impact on today’s network monitoring. Nearly 88% of enterprises surveyed either currently deploy SD-WAN today or plan to do so within the next 12 months. SD-WAN technologies possess sophisticated, built-in capabilities for operations and management and advanced automation to address network problems in real-time. Join us on May 16 as we uncover the importance of validating SD-WAN intelligence while applying advanced analytics to correlate customer experience impact for comprehensive, end-to-end modern network assurance. Enterprises are undergoing a revolution in their infrastructure as the application world is being transformed by cloud technologies. 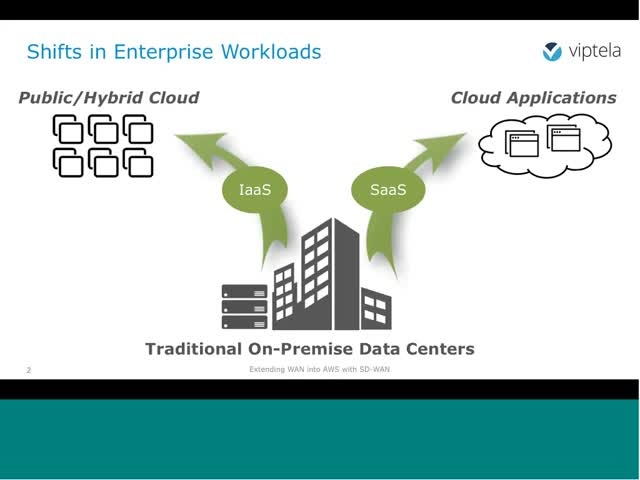 Today your applications can be located in the data center, through IaaS, or in a SaaS cloud. Similarly, users are transforming with mobility; no longer are they tied to one location. Enterprises want to solve the problem of connecting users to their applications in a consistent and secure manner. The overarching issue is the connectivity between these two worlds as we're stuck in two-decades old technology. Enterprises are therefore challenged with the requirement to transform their infrastructure while integrating underlying legacy technologies, and for the user to access their applications while maintaining policy and security framework. Join our CEO as he discusses how IT infrastructure is being transformed during the era of cloud technologies, and how Enterprises across a number of industries can embrace the network revolution. In Part 2, the CTO PoV will focus on Security for IoT and Cloud in Enterprise Networks. IoT, Cloud and Mobile devices are stretching the traditional limits of IT security. As enterprise applications change and technology advances, the fundamental network infrastructure needs to support a robust security framework. Khalid Raza (CTO, Viptela) & Danny Johnson (Director, Verizon) share their Point of View on why current WAN infrastructures are not designed to support new enterprise traffic patterns, and how emerging security approaches designed around segmentation and policy can help organizations adapt to these changes. Enterprises can protect their Cloud and enterprise against attacks and data leaks while migrating to a cost-effective Hybrid architecture. Rapidly changing enterprise application requirements, the cloud, and mobile computing are placing stress on traditional wide area networks (WANs). Enterprises are being challenged to rethink network architectures to meet present and future business requirements. Khalid Raza, CTO and Co-Founder at Viptela, will discuss why current WAN infrastructures are not designed to support new enterprise traffic patterns, and how emerging approaches can help organizations adapt to these changes. Simplifying how enterprises interconnect their sites.